Of the U.S. Cold War assets, six caves and two storage facilities in central Norway exist as if a part of an action-movie film set. 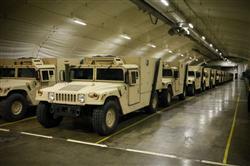 However, they are part of a remote Marine Corps program known as the Marine Corps Prepositioning Program-Norway. Although the Soviet threat is gone and there is an improved security posture across Europe, MCPP-N still plays a vital role in the Marine Corps. That was demonstrated during Exercise Cold Response 2012, where Marines validated the prepositioning concept as well as the interoperability between the United States and Norway. “With 10 years of the war on terror, this is one of those parts of the Marine Corps not well-known to the people outside the program,” said Col. Mark A. Smith, deputy commander of the 24th Marine Regiment, 4th Marine Division. The caves, formally part of the Norway Air-Landed Marine Expeditionary Brigade, have been in operational capability since January 1990. Following a bottom-up review in 2004 directed by Gen. Michael W. Hagee, 33rd Commandant of the Marine Corps, the program was refocused for today’s use. Whereas the caves in Norway were designed to hold a large portion of equipment and 30 days of supply for the NALMEB of about 15,000 Marines, the focus in recent years has turned more to theater security cooperation engagements across multiple theaters. The program is currently evolving into a broader range of support as the Marine Corps is looking into other supporting roles for the program. Brig. Gen. Charles G. Chiarotti, the deputy commander of Marine Forces Europe, said the program will see more options available for the employment of the equipment. Equipment has recently been pulled for humanitarian help after Turkey’s earthquake last year and to support fighting forest fires in Russia in 2010. However, disaster relief is not the only function of MCPP-N. With the equipment in place, the Marine Corps can send in a Marine Expeditionary Unit to respond to any emergency. The equipment from the caves can be utilized for combat requirements as it was utilized in Operation Iraqi Freedom, said Norwegian Capt. Ola Gilberg, the cave manager of the Frigaard Cave in central Norway. It can be also used for training purposes by the Black Sea Rotational Force or other exercises. Only a small amount of the equipment was pulled from the caves for this exercise, said Gilberg. The cave here has 250,000 square feet of storage capacity and holds motor transport equipment, arsenal equipment and medical supplies. Pulling ten Humvees, cold-weather equipment and multiple crates of Meals Ready-to-Eat, Smith called the exercise a small test. The task of pulling out the equipment was accomplished by both the Marines and Norwegians, as they primarily operate the caves. Once the necessary equipment is pulled out and staged by the Norwegians, Marines arrive to inventory and mobile-load the equipment for onward movement from the caves to its employment site or sites. If it is leaving Norway, they will either drive the equipment down to the port or the airfield. However, being in a winter environment like Norway, not all the equipment can be moved by the Marines. This is where the Host Nation Support Battalion came into play. The Host Nation Support Battalion helped Marines move some supplies as the Marines did not have the capability to transport supplies across the snowy Norwegian countryside. “There is no test like practical application,” said Smith. As the MCPP-N program was tested flawlessly, the process itself has also hardened the relationship of Norway and the Marine Corps. The Soviet threat that the MCPP-N caves have been built for is long gone, but with the valuable training and operation of the concept, the operability remains relevant today and toward the future.